"Christmas has come, and with it a sparkling white winterfrost over the countryside. But twelve-year-old Bettina’s parents have been called away unexpectedly, leaving her in charge of the house, the farm, and baby Pia. In all the confusion, Bettina’s family neglects to set out the traditional bowl of Christmas rice pudding for the tiny nisse who are rumored to look after the family and their livestock. No one besides her grandfather ever believed the nisse were real, so what harm could there be in forgetting this silly custom? But when baby Pia disappears during a nap, the magic of the nisse makes itself known. To find her sister and set things right, Bettina must venture into the miniature world of these usually helpful, but sometimes mischievous folk. A delightful winter adventure for lovers of the legendary and miraculous." What are the selling points for me? Christmas. That alone should do it. White winterfrost. I'm practically swooning. A Christmas story set in Denmark? Extra bonus points. I ignored the part in the description about a twelve year old in my haste to get my hands on a copy of the book. I barely noticed that bit. Part of me wondered if I would be ruined by the story as a result of bad writing. I also know that I am pretty deft to poor writing when it comes to a fun Christmas story. My pain tolerance is unusually high during the holidays. (It's a good thing Twilight isn't Christmas-themed.) So, whatever came, I was ready to enjoy myself. I give the above disclaimer because I don't feel as if I can tell you with certainty whether the writing was poor or fantastic. The only claim I feel qualified to make is in saying that if you give Winterfrost a go, you'll find yourself highly entertained. I tried to read the book objectively but nothin' doing. Christmas, gnomes and snow were completely consuming and I had a blast reading this book. 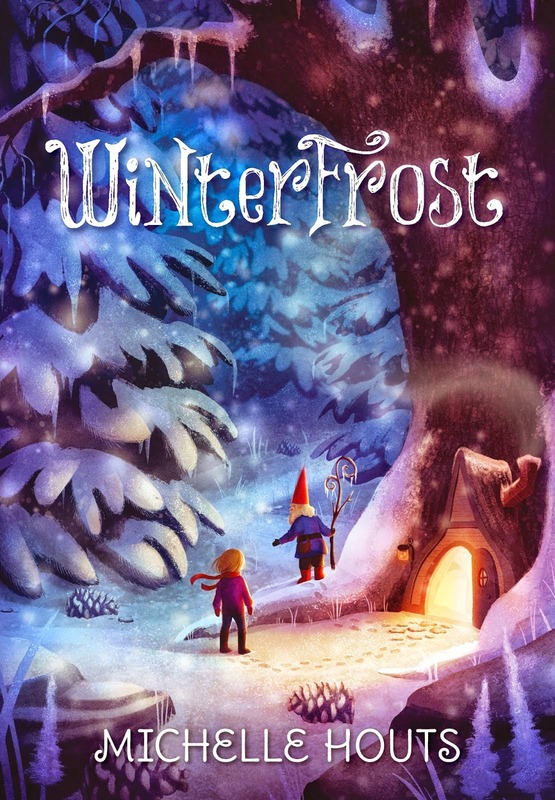 Personally, I enjoyed Winterfrost and would recommend it to anyone who is looking for a fun Christmas/winter story. This is a chapter book but the sentences are spaced and the story is easy reading. My eight year old won't have any trouble with it. I might generally recommend it for ages 9-12 as the publisher suggests, but then I'd be aging myself out of it and that would be a mite embarrassing. Houte gets two thumbs up from me! Thank you for the entertainment. I've been itching to read this book(the cover!!! ), but I only knew there were gnomes in the story. The fact that it's Christmas related makes me want to order it right now(even more than before)! This sounds like a fun one to enjoy with my younger crowd! I would read it aloud to my kids (ages 3, 5 and 8) if I had the time, no problem. I don't think it would disturb anyone at all. There is a "bad guy" who turns out not to be so bad and scary and it's a fairly calm story, all things considered. I wouldn't hesitate to read it to *my* six year old at all.